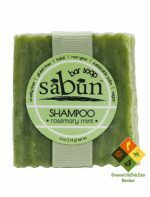 Short Product Description: Never heard of a shampoo bar? Well, you’ll be happy to find out that this bar works just as well as liquid shampoo (if not better)! Never heard of a shampoo bar? 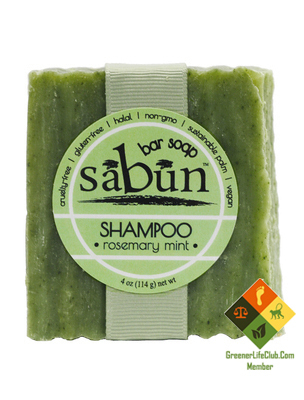 Well, you’ll be happy to find out that this bar works just as well as liquid shampoo (if not better)! Simply rub the bar in your hair for a few seconds and an enormous amount of thick, rich lather will appear; then you can scrub your hair as normal. After that, just rinse it out and condition, if you like. It’s that simple. Give it a try- the refreshing rosemary-mint essential oil blend makes for a wonderfully stimulating bath or shower experience. Directions: Wet hair, rub bar in hair for a few seconds, lather will appear-scrub hair as normal, rinse. Repeat as necessary. 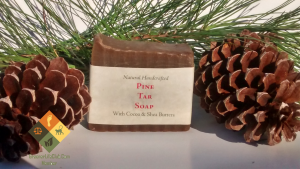 It’s recommend that the bar be rubbed directly in the hair for a few seconds or until a nice lather appears. After that, the shampoo bar should behave similarly to bottled shampoo. Ingredients: Water (Aqua), Organic palm (Elaeis guineensis) oil, Organic coconut (Cocos nucifera) oil, Olive (Olea europaea) oil, Sodium hydroxide (Lye), Castor (Ricinus communis) oil, Almond (Prunus dulcis) oil, Stearic acid (plant-based), Peppermint (Mentha piperita) essential oil, Rosemary (Rosmarinus officinalis) essential oil, Organic spirulina (Arthrospira platensis) powder.